The CPU was maxed out on any ESPN.com page. Thread #0 was the offending thread. 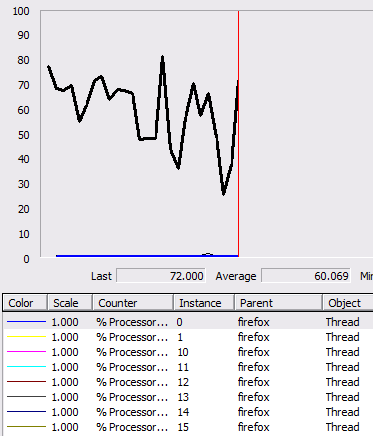 Firefox’s working set increased steadily while looking at ESPN. Firefox eventually crashes with an A/V if the browser is left on ESPN. I’m not sure if this is some strange interaction of my specific combination of extensions and settings, or if this happens for all Firefox users. This seems like a possible security vulnerability, but I can’t say one way or the other. I suppose I could have downloaded and compiled the source code for Firefox to figure things out, but that was way more effort than I felt like giving. I did managed to debug and fix this issue for myself—without source or symbols—which I think makes for an interesting writeup. Although this kind person has done his own workaround for 1.5, it was either brought to its knees by the ESPN site or was broken by something else. I set a breakpoint on all of these. As an only slightly educated guess, I used the Adblock extension to block this script. After reloading the page, the problem was gone! 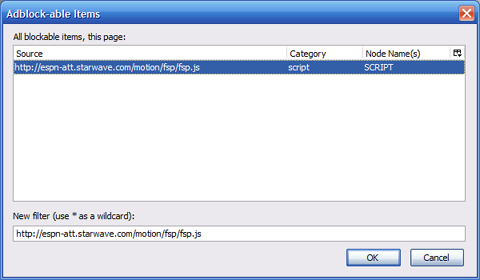 There don’t seem to be any site-breaking problems associated with turning this script off. This is all or part of the “ESPN Motion” business that tries to display sound and video on the site. Hey, ESPN: this is a terrible idea in the first place. Your website shouldn’t start yelling at me when I visit it. It’s no excuse for Firefox to A/V, but I thought everyone with a three-digit IQ stopped doing this in 1996.